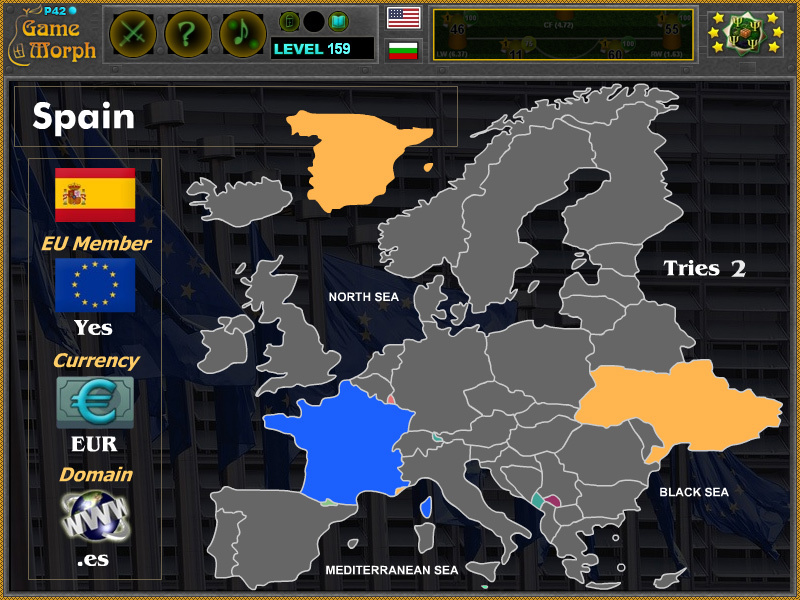 "Europe Puzzle 2019" is a free online game to drag and drop the Europe and EU in their correct places. Sort the European countries in correct places on the map of Europe. Each puzzle piece is a different country, with its name, flag, currency the country uses, indicator if it is a member of European Union (EU) and top level domain of the country. Free online game to explore and study the countries of Europe in 2019. Geography game, suitable for online lessons and interactive classes. Minute to win it game. Drag and drop Europe states. Europe jigsaw online. 38 Interactive Countries of Europe in 2019. Learn and explore Europe with this Interactive Europe map. Sort all 38 provinces by size, shape and location. Interactive political map of Europe and EU. Kosovo - currency: EUR - ES: No - domain: .?? Info from Wikipedia. Vector map of Europe by freepik.com. Program code by Ogo Bob. How to play Europe Puzzle 2019. You recieve one puzzle piece at a time, representing one European country, to place it on the blank map of Europe. Drag the country to remove the frame and show detailed information of the country. If dropped in the correct place the country becomes colored and next puzlle piece appear in the frame. If dropped incorrectly one try counter point is added and the country may be moved again untill placed correctly. Do this for all 38 movable countries to win the game. Know the countries of Europe in 2019 and get +1 Knowledge Level. There are 50 internationally recognised sovereign states with territory located within the common definition of Europe and/or membership in international European organisations, of which 44 have their capital city within Europe. All are either member or observer states of the United Nations (UN), and all except Belarus, Kazakhstan and Vatican City are members of the Council of Europe. 28 of these countries have also been member states of the EU since 2013, and 27 after 2019. In 1967 the European Coal and Steel Community and Euratom formed the European Community, which in 1993 became the European Union. The EU established a parliament, court and central bank and introduced the euro as a unified currency. Between 2004 and 2013, more Central and Eastern European countries began joining, expanding the EU to its current size of 28 European countries, and once more making Europe a major economical and political centre of power. However, in June 2016 the people of the United Kingdom, in a non-binding referendum on EU membership voted to leave the European Union in 2019. Today 27 European states are members of the politico-economic European Union, 25 of the border-free Schengen Area and 19 of the monetary union Eurozone. Among the smaller European organizations are the Nordic Council, the Benelux, the Baltic Assembly and the Visegrad Group. The euro (sign: €; code: EUR) is the official currency of 19 of the 27 member states of the European Union. This group of states is known as the eurozone or euro area, and counts about 343 million citizens as of 2019. The euro is the second largest and second most traded currency in the foreign exchange market after the United States dollar. There are also countries in Europe which are not members of EU, but use euro as official currency, like Montenegro and Kosovo. Which are the countries of EU? Which is the biggest country inside Europe? Which countries use the euro EUR?